To watch this event, please click here. Jacques Schiffrin changed the face of publishing in the twentieth century. As the founder of Les Éditions de la Pléiade in Paris and cofounder of Pantheon Books in New York, he helped define a lasting canon of Western literature while also promoting new authors who shaped transatlantic intellectual life. 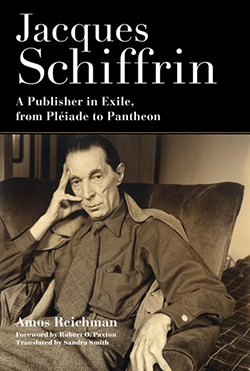 In this first biography of Schiffrin, published by Columbia University Press, Amos Reichman tells the poignant story of a remarkable publisher and his dramatic travails across two continents. Just as he influenced the literary trajectory of the twentieth century, Schiffrin’s life was affected by its tumultuous events. Born in Baku in 1892, he fled after the Bolsheviks came to power, eventually settling in Paris, where he founded the Pléiade, which published elegant and affordable editions of literary classics as well as leading contemporary writers. After Vichy France passed anti-Jewish laws, Schiffrin fled to New York, later establishing Pantheon Books with Kurt Wolff, a German exile. Following Schiffrin’s death in 1950, his son André continued in his father’s footsteps, preserving and continuing a remarkable intellectual and cultural legacy at Pantheon. In addition to recounting Schiffrin’s life and times, Reichman describes his complex friendships with prominent figures including André Gide, Jean-Paul Sartre, Peggy Guggenheim, and Bernard Berenson. From the vantage point of Schiffrin’s extraordinary career, Reichman sheds new light on French and American literary culture, European exiles in the United States, and the transatlantic ties that transformed the world of publishing. Amos Reichman is the author of Jacques Schiffrin: A Publisher in Exile, from Pléiade to Pantheon. Sandra Smith translated the book into English. Eric Jennings is Distinguished Professor, History of France and the Francophone World and his latest book is Escape from Vichy: The Refugee Exodus to the French Caribbean (Harvard, 2018). Susan Suleiman is the C. Douglas Dillon Professor of the Civilization of France and Professor of Comparative Literature. Her most recent books include Irène Némirovsky and the 'Jewish Question' in Interwar France and Performing a Perpetrator as Witness: Jonathan Littell’s Les Bienveillantes. Robert O. Paxton is Emeritus Mellon Professor of Social Sciences at Columbia University whose books include Vichy France: Old Guard and New Order, 1940-1944 and Vichy France and the Jews. Adam Tooze is Kathryn and Shelby Cullom Davis Professor of History and the director of the European Institute. This event is co-sponsored by the Maison Française, the European Institute, the History Department, and Columbia University Press.